Program and further informations can be found on the conference website www.evg2017.net. Here you can download the CONFERENCE POSTER and the BROCHURE (PDF,1.2 MB). Theo Hug, Michael Schorner, Josef Mitterer (Hg.) 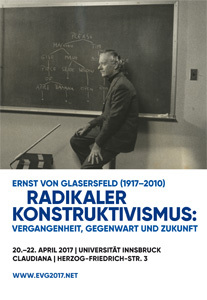 (2015): Ernst-von-Glasersfeld-Lectures 2015. innsbruck university press (ISBN 978-3-902936-93-6). an online version can be retrieved from here. Theo Hug, Michael Schorner, Josef Mitterer (Hg.) (2013): Ernst-von-Glasersfeld-Archiv. Eröffnung – Inauguration. The official Inauguration of the Ernst-von-Glasersfeld-Archive was celebrated on Friday, March 22nd 2013. Welcome to the new website of the Ernst von Glasersfeld-Archive. The archive is part of the Research Institute Brenner-Archives at the University of Innsbruck and is located in the old town. For those who are interested in the work of EvG and Radical Constructivism we will provide published as well as yet unpublished material from the literary estate within the next time. This site will not only focus on the philosopher and scientist Glasersfeld, a part of it is also dedicated to some documents from Ernst von Glasersfeld’s private life. Ernst von Glasersfeld was born in Munich/Germany in 1917 as the son of a diplomat of the Habsburg Monarchy. He spent his childhood and early youth in Meran/Italy. After finishing the boarding school in Zuoz/Switzerland he began to study mathematics in Zurich and Vienna. Having been offered a job as a ski instructor in Australia he also won the title of the first Australian downhill champion. With his first wife Isabel he spent the time of World War II as a farmer in Ireland, where he discovered the works of George Berkeley and Giambattista Vico. In 1946 he returned to South Tyrol and worked as a journalist for several newspapers. He became acquainted with the linguist and philosopher Silvio Ceccato, soon becoming a member of Ceccato’s interdisciplinary Scuola Operativa Italiana. In 1959 he became research assistant for Ceccato’s Center for Cybernetics in Milan where he was leading a research project on machine translation. Soon he got in contact with some prominent cyberneticists including Heinz von Foerster. In 1966 he permanently moved to the USA to continue the project which was funded by the U.S. Army at the University of Georgia. In the early 1970s Glasersfeld developed “Yerkish”, an artificial language for non-human primates. Especially the works of Jean Piaget became essential for the development of Glasersfeld’s thinking. In 1974 he obtained the U.S. citizenship. Together with his friends Heinz von Foerster and Paul Watzlawick he founded Radical constructivism, a position that is still highly influential for a variety of research disciplines. Following his retirement as a professor of cognitive psychology, Glasersfeld continued his research at the Scientific Reasoning Research Institute in Amherst, Massachusetts. Glasersfeld received awards from universities and scientific societies in several European countries, in the United States and Canada. 2008 he received the honorary doctorate of the University of Innsbruck. Ernst von Glasersfeld died in Leverett / Massachusetts in 2010.